As the name suggests, you instantly feel at home. The staff were rushed off their feet, yet still had time for a chat. I genuinely loved being in this place. The menu is brilliant. It combines the favourites you are looking for with a little Home Sweet Home creativity. They have time honoured classics alongside crackers items such as the cheeseburger toastie. Yep. 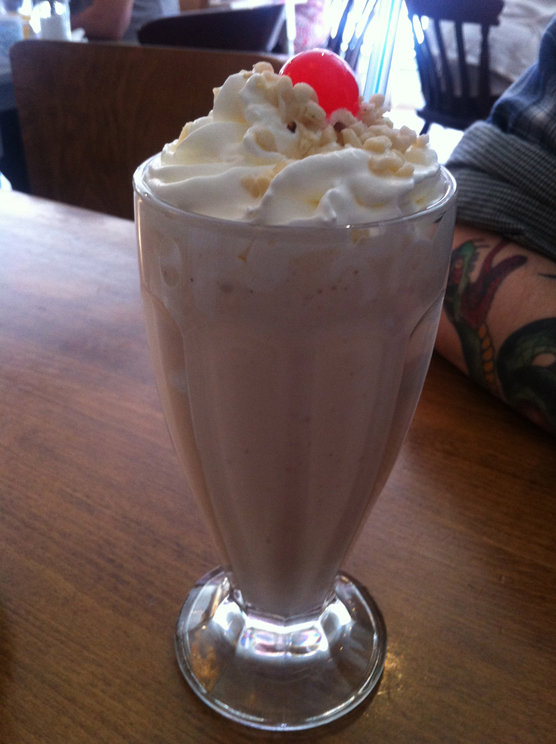 My husband had a Charlie Brown milkshake, which is 'peanut butter and jelly sandwich blended with vanilla ice cream, malt, skippy peanut butter and raspberry jelly'. He loved it. Sickly enough to satisfy the sweetest tooth. The food was fantastic. We were hoping for home cooked, tasty food which wasn't too heavy. I had the Famous Home Made Chilli. This is a tex-mex lover's dream! 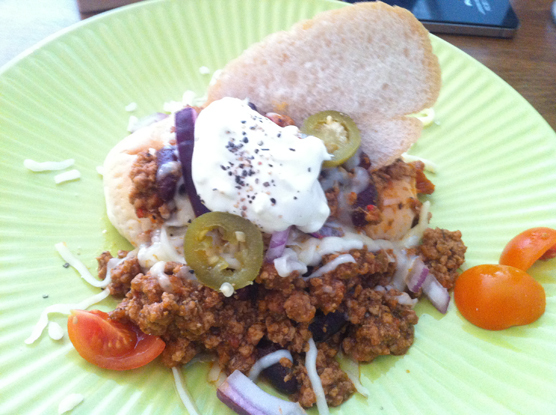 It came served on a crusty roll with plenty of grated cheese, jalapenos and a healthy dollop of sour cream. It was utterly divine! I'm confident I could have eaten twice the amount, but I'd have needed rolling home. My husband opted for his cafe favourite. 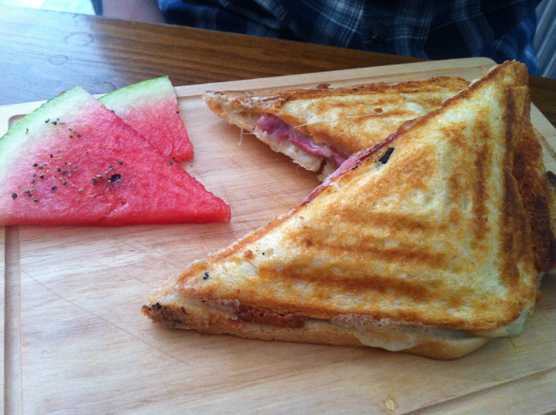 The humble cheese and ham toastie. He just can't resist! I suppose it's a simple dish but easy to get wrong. No-one wants a floppy old bit of bread. This one was crisp with a decent amount of cheese inside. I pinched a bit... it was yummy. Oddly it was served with two chunks of watermelon, but it worked remarkably well! I think the sunshine outside helped. Even though I felt fit to burst, I had gone to Home Sweet Home for cake, and I was not leaving without it. I chose the Golden Syrup Ginger Cake. 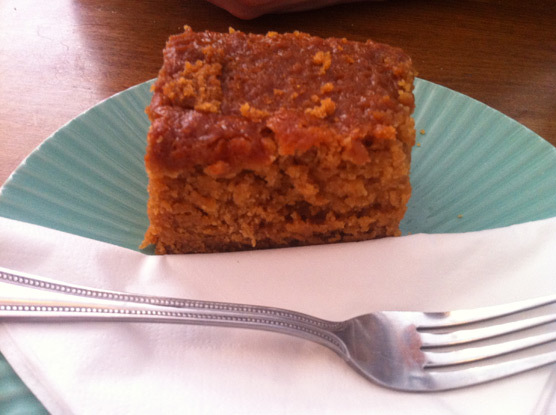 It was really moist and sticky, and reminded me of a refined version of Jamaica Ginger Cake. I'm a little ashamed to say that I only managed half, and even more ashamed that I snaffled the rest into my bag and scoffed it later... piglet. We'll definitely be going back to Home Sweet Home. I really can't think of anything bad to say about our experience. It was relaxed yet timely, homemade yet wonderful and simple yet thoughtful. 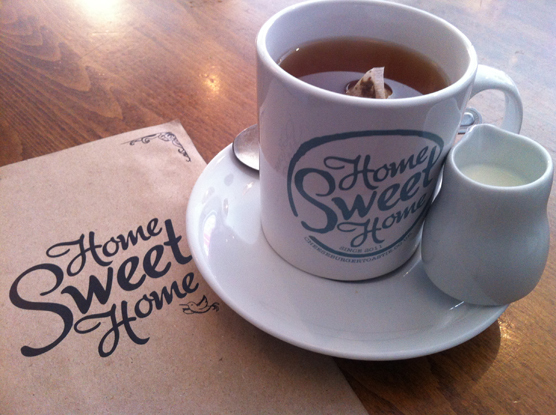 Disclaimer: I reviewed Home Sweet Home because I had heard brilliant things about it. They did not know I was going to write a review, and I was not paid for doing so. Read more about Home Sweet Home.